The number of measles cases reported in 2018 was notably higher than that seen during the previous 8 years. There were 2 outbreaks involving 11 cases. Contact investigations were conducted for the 19 people who spent time in Florida while infectious with measles and involved at total of 2,945 potentially exposed contacts. Vaccination is the best way to prevent measles, and 100% of cases were never vaccinated. In 2018, 15 measles cases were reported in 4 counties. Fewer than 10 cases were reported each year from 2010 to 2017. In 2018, a total of 15 Florida residents and 4 visitors with measles spent time in Florida while infectious. 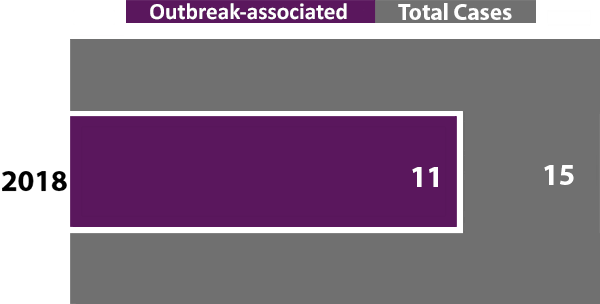 Fifteen total cases were reported in 2018 and, of those, 11 cases were outbreak-associated. Heightened response during measles investigations helps to connect cases. There were two outbreaks in Sarasota and Pinellas counties reported in 2018. A total of 2,945 people who had possible exposure to the 15 Florida residents and 4 visitors with measles were identified. There were 6 main exposure settings, with the most contacts identified in health care facilities. Contact investigations are conducted to determine the vaccination status of those potentially exposed to measles, identify new cases, and prevent further transmission. Vaccination is the best way to prevent measles infections. In 2018, all 15 cases were unvaccinated for measles. Due to generally high vaccination rates, measles in Florida is rare but occurs every year and is most often associated with international travel.